PERIOD OF RECORD.--Discharge records from October 1961 to current year. GAGE.--Water-stage recorder. Datum of gage is 787.42 ft above National Geodetic Vertical Datum of 1929 (levels by U.S. Army Corps of Engineers). Prior to August 6, 1970, non-recording gage at same site and datum. 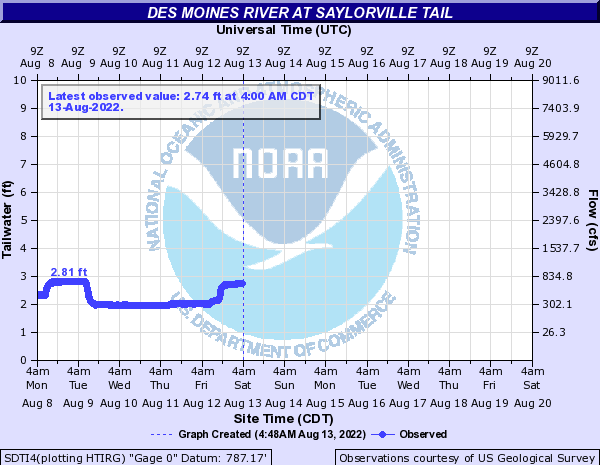 REMARKS.--Flow regulated by Saylorville Lake (station 05481630), 2.3 mi upstream, since April 12, 1977. PERIOD OF RECORD.--Water years 1962-2004. SPECIFIC CONDUCTANCE: Daily instantaneous values collected in conjunction with suspended-sediment samples, December 1967 to September 2004, records fragmentary. WATER TEMPERATURE: Daily instantaneous values collected in conjunction with suspended-sediment samples, October 1961 to September 2004, records fragmentary. SUSPENDED-SEDIMENT CONCENTRATION AND DISCHARGE: October 1961 to September 2004.